The first bottlenose dolphin , a female weighing over 400 pounds , and her calf, about 125 pounds arrived in April, two months before the oceanarium opened. The porpoises proved not only hardy but entertaining, and as the months passed the collecting boat was busy adding to their numbers in the circular Oceanarium. The sharks, which do not get along with the porpoises, were placed in the rectangular tank with the barracudas and hundreds of smaller varieties. Tolstoy, was using an anesthetizing harpoon and transporting well in the collecting boat. The boat called the Porpoise was christened by the wife of the Florida governor. Looking vaguely like a shrimp boat, this vessel had been constructed if wood by one of the last old -country Greek shipbuilders. 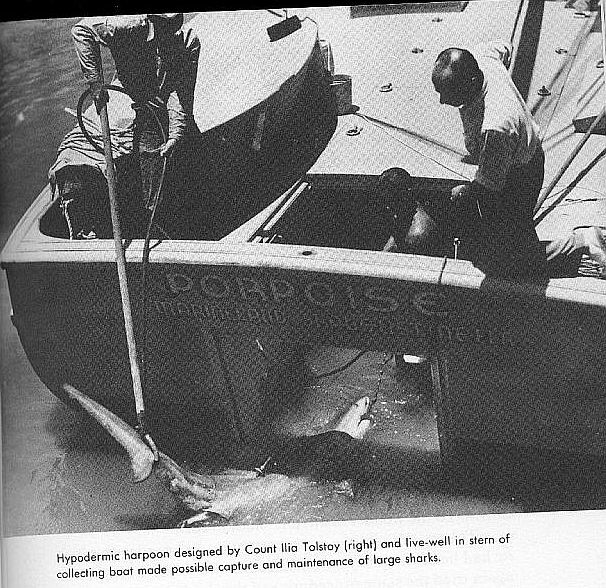 Capable of cruising nine hundred miles without refueling, the Porpoise had one feature similar to that of whaling ships: a trap door in the stern which could be opened to admit sharks. As soon as one was caught and anesthetized, it was necessary only to open the door in the stern and lead the shark into a flooded compartment twenty feet long and four feet wide. Here, he could ride to Marine Studios, land on the Inland Waterway and be withdrawn to the oceanarium in a canvas or rubber tub without leaving the water. 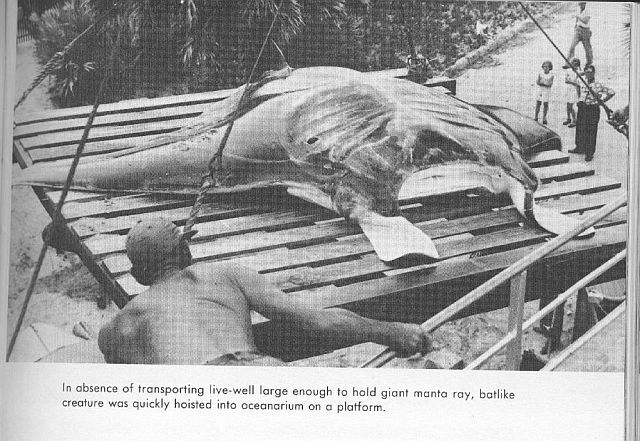 The first manta, thirteen feet from tip to tip and weighing fifteen- hundred pounds, was netted in the surf a mile and a half north of the oceanarium, The efforts of twenty-four men and a gasoline crane were required to pull him ashore and move him to the circular tank.